Champaign-based Eco-Justice Collaborative and Prairie Rivers Network have been calling on Houston-based Dynegy to responsibly close its coal ash pits along the Middle Fork of the Vermilion River at its now shuttered Vermilion Power Plant in Oakwood, Illinois, about 25 miles east of Urbana. Two of its three pits are leaking coal ash contaminants into the river, and the natural forces of the meandering river are aggressively eroding riverbanks that separate coal ash from the river channel. The Middle Fork is Illinois’ only National Scenic River. It is one of the most biologically-diverse streams in the Midwest and is a regional draw for kayaking, canoeing and tubing. On Wednesday, January 31, 2018, Prairie Rivers Network filed official notice that it intends to sue Dynegy, accusing the company of repeatedly violating the Federal Clean Water Act. Earthjustice, a nonprofit environmental law organization is representing Prairie Rivers Network. Testing by Dynegy and Prairie Rivers Network show coal ash contaminants are leaking into the river. They include toxic heavy metals such as arsenic, barium, boron, chromium, iron, lead, manganese, molybdenum, nickel, and sulfate. 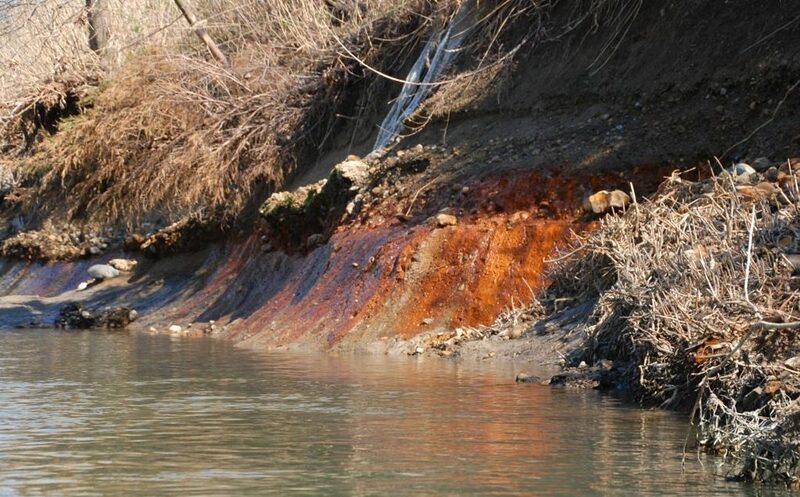 The toxic chemicals leaking from the coal ash pits have stained the riverbank a shimmery orange, rust, and purple color and turned the river water orange. The riverbanks are eroding and the abutting coal ash pits are leaching coal ash contaminants into the surface and groundwater. Photo by Pam Richart, Eco-Justice Collaborative. April 2016. Several of these contaminants were found at concentrations in excess of federal and Illinois standards for protection of human health and the environment. Exposure to these toxics raises the risk for cancer, heart disease, and stroke, and can inflict lasting brain damage on children. Watch the Video of the press conference held at Kickapoo Adventures, near the Middle Fork on Wednesday, January 31st. It features Andrew Rehn, Water Resources Engineer, Prairie Rivers Network; Michael Marron, Chair, Vermilion County Board; Vince Rancuret, Vermilion County resident; and Jenny Cassel, Coal Ash Attorney, Earthjustice.